Maintaining an outdoor fish pond can require some work. Making a leaf screen to cover the surface of the pond serves two purposes: It keeps debris like sticks and leaves from getting into the water, and the screen will prevent the contents of the pond from being disturbed by outdoor predators. Creating this screen can easily be done at home, ensuring that each pond's unique shape and size are covered completely. Measure the total area of the pond that will be covered. Assemble tubing into the shape to be covered using connectors and elbow joints. The PVC material can be cut or bent to accommodate unusual shapes and variances in the height of the pond. Make sure the frame is securely held together with the PVC glue -- if it collapses or comes apart, the screen could fall into the water or tear. Measure the screen using the frame as a guide. If screening is not available in a large enough size, multiple pieces can be stitched together using wire or fishing line to reach the necessary size. Cut the screen about 6 inches larger than necessary, as the excess will be wrapped around the tubing before being secured. Place the screen on the ground, and place the frame on top of it. Pull the screen edges taut around the tubing, then mark the location where the edge of the screen meets what will be the underside of the surface with chalk. Marks at intervals of 6 to 8 inches will ensure that the screen remains tight while secured to the frame. Attach Velcro at the marked locations, and wrap the screen around the tubing to secure. It's imperative that the screen not sag and touch the water's surface. 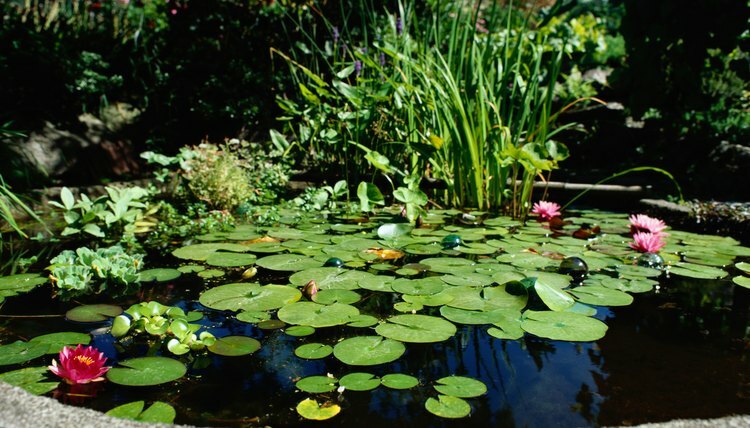 This may prevent fish and animals in the pond from surfacing, and it can also cause the plants to grow around or into the screen. Personalizing the leaf screen comes next. The tubing can be painted to match the surrounding environment, creating a more cohesive look. This will also help to hide the Velcro, allowing it to blend in with the grass, rocks, dirt or other items that will be near the pond. Keep in mind that choosing weather-resistant materials is necessary, otherwise touch-ups may be needed. Place the screen over the pond. Once the screen is situated, you can anchor it by digging into the ground and covering the tubes with the dirt. When digging, make sure that enough space is left between the edge of the pond and the frame to keep it from slipping into the water. Another option is to lay the frame on top of the ground, and use rocks or bricks to hold the frame in place. Having some sort of weight on the frame will keep animals from moving it out of place, as well as protect it from shifting in storms and wind. Stakes that are attached with tie downs and driven into the ground can also serve as a way to keep the leaf screen in place over a pond's surface. Check the leaf screen regularly, as it's possible for debris to cause tears in the mesh. It can easily be patched or replaced using the same frame in order to make the apparatus last. The screen should be replaced when it begins to sag or stretch, as a malfunctioning leaf screen will not provide adequate coverage for an outdoor pond. Use screening with small openings, as larger holes will not keep smaller leaves and stones from dropping into the water. Clean off the surface of the screen often, as added weight may cause the screen to sag or tear quickly. Wire mesh can be used in place of screening as a more heavy duty option, but it will need to be attached with screws to the tubing, not Velcro.